We’re kicking off a year-long series of radical ImageVault upgrades to the service that will enable you to do so much more with our websites and tools, and so much more with your photography. We’ll deliver on this promise in stages throughout 2012, starting with the first phase on March 24, 2012. 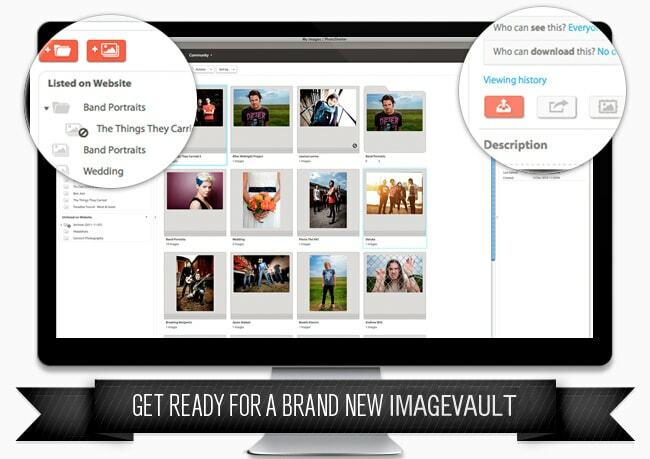 Each phase will improve the way you use your ImageVault website, access your photos, market products and services, collaborate with clients, distribute your photos, and manage your photography archive. A beautiful website, new ways to show off your photography, and more! On March 24, 2012, we’re bringing major upgrades to the way we manage and organize your images, assign client access and visibility, and handle online image delivery. We’re extremely excited to bring you this first set of enhancements. (And we’re equally excited about what’s to come throughout the year.) We also recognize that all changes, even massive improvements, require some adjustment, so we’ll be here for you as we make the transition together. We’ll have several more upgrades so stay tuned!